The S5 Junior Stock Moto category is the beginning rung in the Superkarts! USA ladder system. Drivers 12 to 15-years-old are given the opportunity to develop themselves as drivers, man-handling the six-speed monster that is the Honda CR125 powerplant. From there, they take the same Stock Moto engine package to develop themselves further in the S2 Semi-Pro division. Once they reach the top echelon of that category, drivers graduate to the S1 Pro category to race against the best in the country and from around the world. Each year, we are introduced to new drivers in the S5 class, with the graduation factor and young drivers coming into the shifterkart genre. The latest name is Callum Smith. The native Australian now lives in northern California, and moved over to the S5 category at the end of 2014 season. We became familiar with the 15-year-old during his time in the TaG Junior division before trading in his single speed engine for the six-speed Honda. 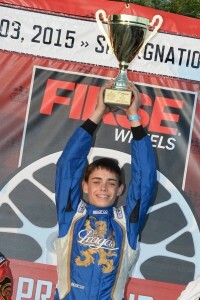 Smith made his S5 debut at the California ProKart Challenge event in Lake Elsinore, placing on the podium in third. 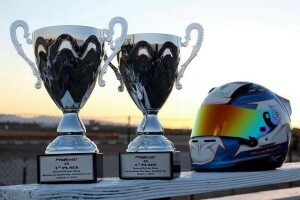 He finished the year with a solid drive at the SKUSA SuperNationals in Las Vegas, landing on the podium in the fifth position. The momentum carried over into the 2015 season, as Smith is becoming the driver to beat. Starting out the California ProKart Challenge, Smith has been near perfect. In three rounds of competition, Smith is 5 for 6 in the heat races, with three feature victories. The third round in Buttonwillow was a complete sweep, from qualifying to the main event with fast lap honors. That record put him at the top of the favorite list going into the Superkarts! 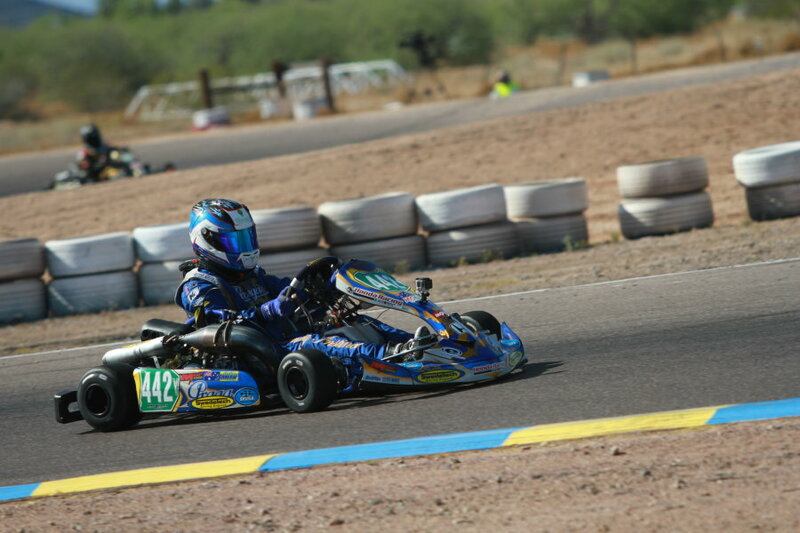 USA Fikse Wheels Pro Tour SpringNationals at the Phoenix Kart Racing Association in Glendale, Arizona. Smith was at the top of the time charts right away in his Praga machine, and set the tone right away in Saturday qualifying. Callum posted the fastest lap in qualifying, four tenths of a second ahead of 2014 TaG Junior champion David Malukas in his first S5 weekend ever. He went on to win the opening heat race by a comfortable margin. The start to Heat #2 was slow, dropping him back to fourth on the opening lap. Smith fought his way forward, taking back the lead on lap three, holding on for the remainder of the race. Callum was off the line clean for the main event, securing the lead through the opening circuit and setting the pace for all 16 laps to his first ever SKUSA Fikse Wheels Pro Tour victory with a 15-second margin. The gap in qualifying on Sunday closed, but it was the same result with Smith at the top of the time sheet over Malukas. The opening heat race went to Smith, leading all eight laps with Malukas on his bumper. Callum won the second heat in similar fashion, as Hunter Kelly slotted into second but three seconds back. The feature was all Smith, going wire-to-wire to complete the sweep, and earn a perfect score on the weekend with maximum points toward the season championship. Smith continued his win streak at the California PKC program this past weekend, winning a fourth feature on the season during the Simraceway Performance Karting Center in Sonoma. Callum will continue his fight for the SKUSA Fikse Wheels Pro Tour championship next month at the New Castle Motorsports Park in Indiana during the SummerNationals. How did you get started karting: I was diagnosed with Crohn’s disease in 2010 and I became very ill, lost most of my weight, and ended up in hospital. When I started to recover, I wanted to get back into a sport, but my medication prohibited me from running, or using my joints. As soon as I was healthy enough, I used a voucher to K1 that my uncle gave me, and I had to get my own go kart. It took off from there. What are your goals in racing: I would like to race IndyCar or at least run in the Indy 500. Although I would be perfectly happy professionally racing any race car. In a few short words, how would describe your driving style: I try to be smooth and consistent. Funniest moment at the track: If you have ever met Tim Campbell, you’ll never forget his stories, which are often hilarious. Our team always has a good time. I have too many to name just one! Favorite food: Aussie meat pie! What do you do when not at the track: Working on karts and r/c cars, working to pay for a new helmet, schoolwork, hanging out with friends, and occasionally play video games. What are your goals outside of karting: Outside of karting, I try to maintain good grades, and get my pilot’s certificate. What type of street car do you drive: I have a 1990 Toyota truck when I get my permit in 4 months, and a 2003 Chevrolet Tahoe when I get my license next April. What type of street car would you like to drive: I’d like to restore a classic muscle car with my dad, or to personally build a MKIV Toyota Supra. What do you think could be done to improve the sport of karting: Less classes, less national series, and lower cost. Find one shifter and TaG package and stick with it. Too much money is dumped into too many motors. It also divides the racing when we have new series frequently coming out and competing with successful ones. What is your favorite aspect of karting: Karting is one of the purest forms of motorsport. Because of this, I make amazing memories with my father every weekend, and it teaches me key fundamentals if I pursue a professional racing career.